Charter school operators, who enroll about 6% of the city's students, are recoiling in shock from Mayor-elect Bill de Blasio's decision to represent the other 94% of city schoolchildren in his transition team. Don't they read Gotham Schools? If they did, they'd know that charters should be covered at least half the time, if not all the time. What is with this guy, including public school parents like Zakiyah Ansari on his team? Doesn't he know she's an advocate for public school children? 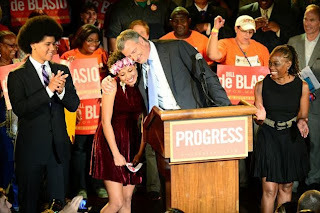 Mayor Bloomberg never paid the slightest attention to her. Bloomberg knew that what was important was finding ways to pay charter operators three times what the NYC schools chancellor made, and indeed there are now several charter moguls raking in big bucks as a result. How are Bloomberg's BFFs going to continue hopping onto the gravy train if this trend continues? Are we going to actually spend city funds on public schoolchildren instead? That would be an outrage. Why would entrepreneurs come to NYC if they can't make money off the sweat of our children? It's bad enough we outlawed child labor. Now, just when we're finally figuring how to make money off the little urchins, along comes liberal de Blasio to throw a monkey wrench into the works. Naturally charter school advocates are outraged. Eva Moskowitz made her kids, their parents, and her at-will employees march in protest. This drew multiple stories from Gotham Schools, and perhaps de Blasio missed them. Gotham, of course, roundly ignores UFT rallies to stop Mayor Bloomberg from pushing his policies onto the mayor-elect, because such rallies are of no importance whatsoever. Naturally, charter advocates, like Gates and Walmart, want to get their money's worth. That's why they fund Gotham Schools. 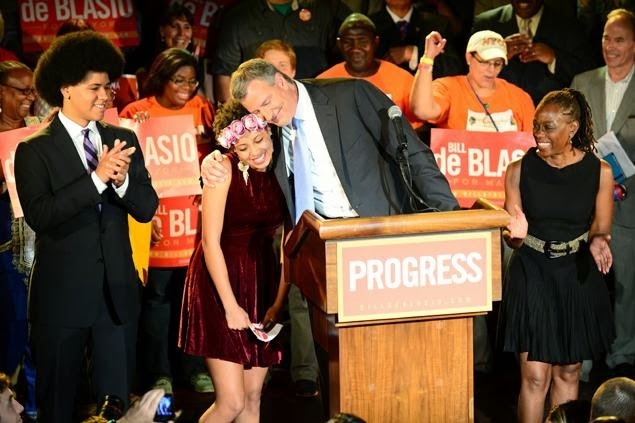 But if Bill de Blasio won't take their money, how can he represent them. After twelve years of a mayor who exclusively represented corporate interests like charter schools, a mayor who did whatever he wished on his fake school board, are we going to have a mayor who actually represents the interests of our children and their parents? What would that New York look like?